Pricing is without the scroll below the directionals. 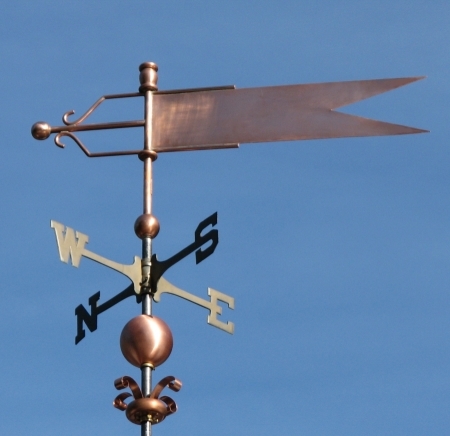 This Decorative Banner #17 weather vane illustrates a design particularly well suited to the addition of a name, numbers or a logo in the banner’s field. This vane is fabricated entirely in copper and will weather beautifully, first darkening into chocolate tones and eventually a patina of lovely greens will develop. Incorporating a logo or name can be done by applying optional gold or palladium leaf gilding in the design selected, through the fabrication process, or a combination of the two. Gilding will remain a bright contrast for many decades as the ferous metals of the vane darken, weather, and eventually patina. The pricing shown is for the banner vane itself and does not include the little decorative piece below the directionals. Call or write for pricing that includes this addition. 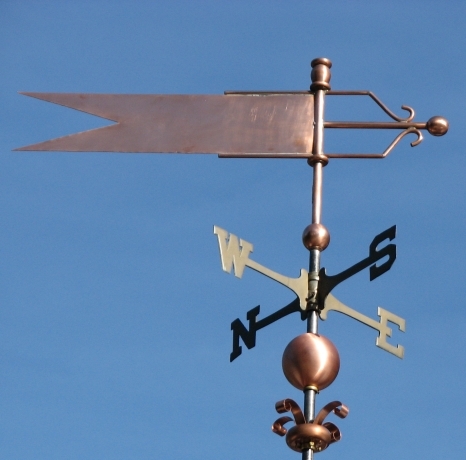 Banners are classic weather vanes and there are many in our catalog. There might be something there that is perfect as designed, or you might want to personalize one of our existing styles. And, of course, you can always have us work with you on an original design.